LONDON (Reuters) - Supporters of Britain's exit from the European Union dumped crates of haddock into the River Thames on Wednesday to protest against Prime Minister Theresa May's Brexit transition deal which they say has betrayed the fishing industry. As part of the transition deal announced on Monday, Britain agreed to remain within the EU's Common Fisheries Policy (CFP) for around 20 months after Britain's exit on March 29, 2019. In Scotland, home to Britain's richest fishing grounds, lawmakers from May's Conservative Party have pledged they will not back a final Brexit deal unless Britain leaves the Common Fisheries Policy altogether. 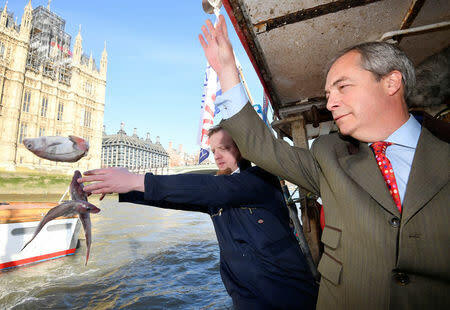 Nigel Farage, one of the 2016 pro-Brexit campaign's most influential figures, and other campaigners flung crates of haddock into the river as a mark of protest against quotas which they say force them to discard edible fish. "It's absolutely tragic, what a waste," Farage told reporters as he tipped fish overboard from a small fishing boat on the River Thames outside parliament. "Nine percent of the haddock quota is all the UK gets from the European Union. It's dreadful isn't it? It absolutely breaks my heart to see that happening, but it's happening on a massive scale all over the country. Can people please wake up?" "It's not about rocking the boat, it's about standing up for important communities across the country," he told reporters when asked if he was worried that he would upset May's government with the protest. "The transition deal is not a good deal, but that if it leads to a proper end state it is something that many people can live with reluctantly," he said.